As expected, she mentioned needing to fix the roads but didn’t delve into details which are expected to come in March. In her words “pot holes aren’t political.” Also on her list is improving the state’s educational results which she claimed came from failure by state leaders, not teachers. Whitmer mentioned the need to improve talent and the large number of open jobs. One way she hopes to improve that is through what she referred to as opportunity scholarships to help make specialized training and higher education more affordable. Her outlined scholarship would provide up to two years of training or public community college education debt-free to students. This would help the state reach her goal of ensuring at least 60 percent of adults have some post-secondary certificate by 2030. A new program, “Michigan Reconnect” will help train adults in high-demand industries to help fill jobs. On the more political front, Whitmer also called for the Legislature to expand protections for the LGBTQ community under the Elliott-Larsen Civil Rights Act. And a republican-priority to lower state auto insurance rates made an appearance towards the end of her speech. Overall, the speech was a different flavor than those of her predecessor, Gov. Snyder. Whitmer focused on reaching out to state workers, women, teachers, the LGBTQ community and ended noting the importance of families and the impact of state policy on our loved ones. She even called for citizen engagement, created the #FTDR (fix the damn roads) hashtag and asked residents and business owners to tweet how they’ve been impacted by Michigan’s crumbling infrastructure. Lastly, she promised to veto any gimmicks, budget band aids or legislation she feels will cut out the right of the people to put forth referendums on the ballot. 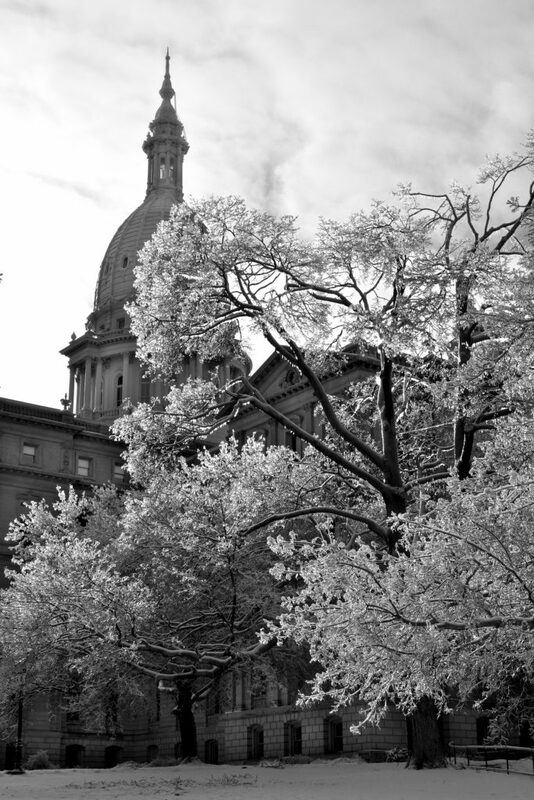 The Michigan House of Representatives will operate a little differently this term as it tries a dual-committee approval process. The chamber has added what are being referred to as “super committees” that will take a second review of legislation before any bills are reported to the House floor for consideration. The four “super committees” include: Appropriations, Government Operations, Judiciary, and the new Ways and Means Committee. This change may provide some tempering of the previous practice of committee chairs reporting bills that haven’t been fully vetted as favors to friends or fellow committee members. A dual-review system will create additional work but should help prevent frivolous or unvetted legislation from making it to the House floor. It also gives retailers double the opportunity to stop bad bills or seek necessary amendments. In other committee changes, the House Local Government and Municipal Finance committee will have purview over bills impacting local government funding or operations. As an example, this means bills that impact property taxes will be referred to this committee rather than to the House Tax Policy Committee. Under an executive order issued by Gov. Whitmer state agencies and departments are now prohibited from asking a job applicant about his or her previous salary history until they offer a compensation package. This could signal the administration’s interest in pursuing legislation to do the same for private businesses. Sen. Chang (D-Detroit) has formally asked Attorney General Dana Nessel for an opinion on whether the Legislature can adopt a citizens’ initiative and then amend it in the same legislative session. MRA members will recall that this is how the legislature made more palatable changes to the $12 minimum wage and paid sick leave initiatives. Several AGs have weighed in on this topic in the past. Former Attorney General Bill Schuette in December wrote that the constitution doesn’t specifically say a Legislature can’t later amend a citizens initiative. Former Attorney General Frank Kelley wrote that changing an initiative would be a “violation of the spirit and letter” of the constitution. While the AG will review the legislative action, it will ultimately fall to the courts to make a final determination. Alcohol multi-licenses: Legislation introduced as SB 82 would allow an entity to hold both on and off premises licenses simultaneously for both liquor and beer and wine. Next steps: Senate Regulatory Reform Committee. MRA Position: Support. Clerk age to sell alcohol: HB 4019 would allow a 17-year old to sell or serve alcohol. Current law only allows individuals over age 18 to sell or serve alcoholic beverages. Next steps: House Regulatory Reform Committee. MRA Position: Support. Cigar tax cap: SB 58 reintroduces legislation from last term that Gov. Snyder vetoed in December. The legislation would eliminate the current Oct. 31, 2021 sunset capping cigar taxes at no more than 50 cents per individual cigar. Next steps: Senate Finance Committee. MRA Position: Support. E-cigarette sales to minors: Several bills banning sales of e-cigarettes and vapor products to individuals under the age of 18 were introduced as HB 4017, HB 4039 and HB 4164. HB 4017 also includes a requirement for online or remote sales to verify age using an independent, third-party age verification service. HB 4164 increases the penalties for sales to minors or tobacco or vapor products from $50 per violation to $100 for a first offense, $500 for a second offense, and $2,500 for a third or subsequent offense. HB 4039 increases the penalties for sales to minors or tobacco or vapor products from $50 per violation to $1,000-2,500 for a first offense, $2,500-$5,000 for a second offense occurring within two years after the first violation. Next steps: House Regulatory Reform Committee. MRA Position: Monitoring. Pregnancy and alcohol warning posting requirements: HB 4112 is a reintroduction of a bill from last term that would require retailers selling alcohol to post a warning of the potential problems of drinking alcohol during pregnancy. The bill was introduced to raise awareness of fetal alcohol syndrome and would add the warning to an existing poster. Next steps: House Regulatory Reform Committee. MRA Position: Support. Tobacco 21: Legislation prohibiting the sale of tobacco products or paraphernalia to individuals under the age of 21 was introduced as HB 4039. Next steps: House Regulatory Reform Committee. MRA Position: Monitoring. Tobacco vending machines: Legislation that would ban tobacco vending machines as of July 1, 2019 was introduced as HB 4040-4041. Next steps: House Regulatory Reform Committee. MRA Position: Monitoring. Credit history info in hiring process: HB 4117 would ban the use of credit history in the hiring process unless the employer is a bank, public accounting firm, casino or insurance companies that offer certain insurance products. The legislation would allow an individual to bring a civil suit to obtain damages or relief. Next steps: House Regulatory Reform Committee. MRA Position: Monitoring. Felony arrest info in hiring process: Legislation introduced as HB 4058 would prohibit an employer other than a police agency from requesting, making or maintaining a record of a job applicant’s felony arrest or detention. Current law only extends this protection to misdemeanor offenses. Next steps: House Judiciary Committee. MRA Position: Monitoring. Controlled substance delivery causing death: Legislation to change where violations of controlled substances causing death that violate the Public Health Code are prosecuted was introduced as SB 20-21. The bills would allow the crime to be prosecuted locally. Next steps: Senate Judiciary and Public Safety Committee. MRA Position: Monitoring. Manufacturer drug cost transparency: Recently introduced HB 4154 would require drug manufacturers to file an annual report detailing their expenses related to producing drugs that cost $10,000 or more for an annual course of treatment. Next step: House Health Policy Committee. | MRA Position: Monitoring. PBM regulation: Legislation that would add new regulations on Pharmacy Benefit Managers (PBMs) was introduced as HB 4155. Next step: House Health Policy Committee. | MRA Position: No position. Dog breed bans: Bipartisan legislation introduced as HB 4035 would prohibit a local ordinance, policy, resolution or rule that limits the possession of certain dogs based on breed or perceived breed. Next step: House Local Government and Municipal Finance Committee. | MRA Position: Support. Marijuana warning label: Legislation recently introduced as HB 4126-4127 would require health warning labels on products containing marijuana that are sold in Michigan. The warning labels would be required on both medical and recreational marijuana products. Next step: House Judiciary Committee. | MRA Position: Monitoring. Prescription discount cards: HB 4043 is a reintroduction of legislation from last term that never moved. The bill would prohibit the sale of prescription discount cards unless they meet a number of new standards. The legislation seeks to clarify that prescription discount card programs are not insurance programs, and it requires a number of disclaimers about the program to consumers. Next step: House Health Policy Committee. | MRA Position: Under review. Stun guns: Legislation that would allow the purchase and possession of stun guns by individuals over age 21 was introduced as HB 4020. It would only not apply to a launchable device like the tasers police officers use. Next step: House Judiciary Committee. | MRA Position: Monitoring. Zoning prohibiting vacation rentals: Legislation clarifying that zoning regulations cannot specifically apply to residential short-term rentals, like vacation rentals by the owner. Next step: House Local Government and Municipal Finance Committee. | MRA Position: No position. City income taxes: HB 4089 would prohibit cities from assessing non-residents with an income tax. Currently 23 cities in Michigan have income taxes, all of which have a resident and non-resident rate. Next step: House Local Government and Municipal Finance Committee. | MRA Position: Monitoring. Property tax increases: Four bills that seek to increase property taxes were introduced as HB 4025, HB 4047, SB 26 and SB 39. These are reintroductions of previous legislation that would increase the cost and length of time it takes to appeal property valuations. The bills would also effectively eliminate using sales of comparable properties to value property, thereby relying on the much more expensive cost approach and increasing property taxes. MRA has strongly opposed past legislation and has already shared our concerns with legislators about this dangerous approach. Next step: House Local Government and Municipal Finance Committee. | MRA Position: Oppose. Special assessment districts: Legislation introduced as HB 4030 would allow a local unit of government to spread the cost of improvements across a special assessment district on a pro rata frontage basis or any other equitable manner. Next step: House Local Government and Municipal Finance Committee. | MRA Position: Monitoring. DDA board makeup: Legislation to allow the designee of a municipal CEO to sit on the board instead of the CEO him or herself was introduced as HB 4101. The bill received a hearing last week and is expected to be reported this week. Next step: House Local Government and Municipal Finance Committee. | MRA Position: Neutral.